The objective of flushing a heating system is to improve circulation and reduce boiler noise problems (caused by sludge and corrosion deposits) to optimise operation. Flushing removes deposits and the problems that they cause. 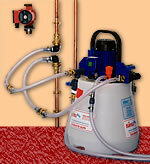 Power flushing involves the use of a special high powered pump and chemicals. (It is not sufficient to attempt to rinse out individual radiators or parts of the system using just a hose pipe and water). We have recently chosen not to offer power flushing as a service, as it can often cause problems such as creating water leaks in a system with a weakness. It is also expensive and not certain to give good results. After flushing a central heating system, we advise customers to have a corrosion inhibitor added to their heating systems. This chemical greatly reduces corrosion / sludge in the future and can protect a system for years. As well as this, we recommend fitting a magnetic filter. This removes black iron oxide from the heating system water. Several versions are available and we can fit these filters without power flushing and have seen good results after a short space of time in a system. We install and service gas appliances, specialising in central heating installation. We carry out Landlord Safety Checks and can report on gas installations prior to home purchases. We are Registered with Gas Safe Register and believe that it is essential that customers understand how seriously we take this.